My maternal 4th great grandmother, Susannah Mitchell was born September 20, 1780, in Sussex County, Virginia, to Thomas Goodwin Mitchell and Ann Raines. She was the oldest of 11 or 12 children. 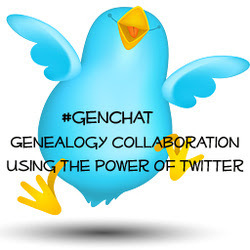 Her siblings were Amy Goodwin, Hartwell, Nathaniel Raines, Richard, Thomas G., Tobitha, Nancy Green, Taylor, John, and Robert. I have a brother named Edward in my tree but I don't have Tobitha listed as a sister. Susannah married Littleton Wyche on May 2, 1798, in Richmond County, Georgia. She gave birth to daughter Nancy in 1799, and by the birth of their second child Thomas Clarke in 1801 (my 3rd great grandfather), they were living in Montgomery County, Georgia, where the rest of their children were born: Rebecca Taylor, Martha Susannah, Maria, Elizabeth, Henry, Margaret Bryan, William, Patience, and Littleton. 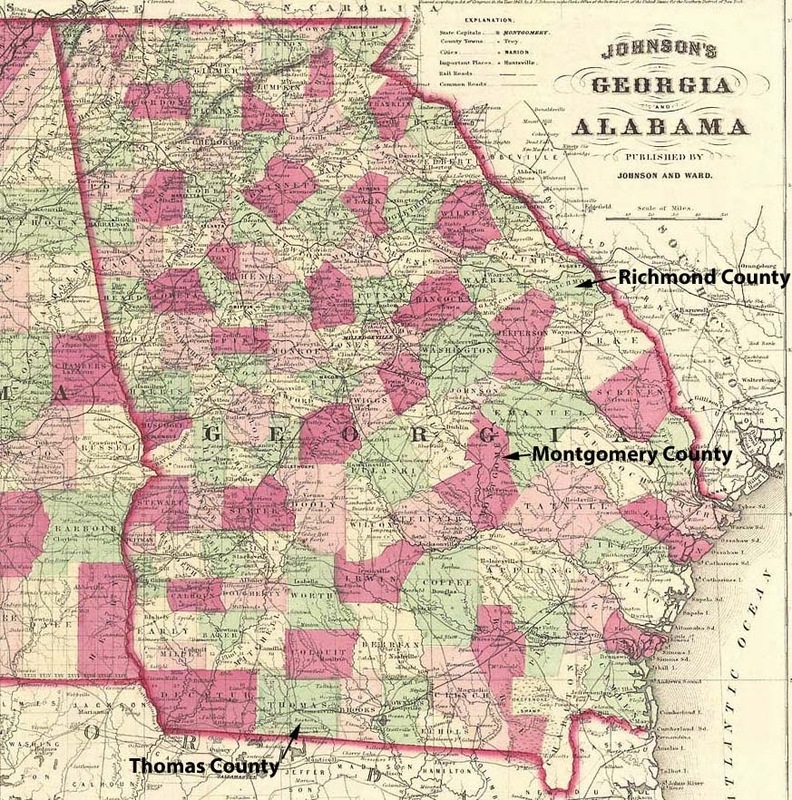 By the 1830 census, Susannah and Littleton had moved their family to Thomas County, Georgia. Littleton died in 1834, and Susannah may have moved in with their son William. 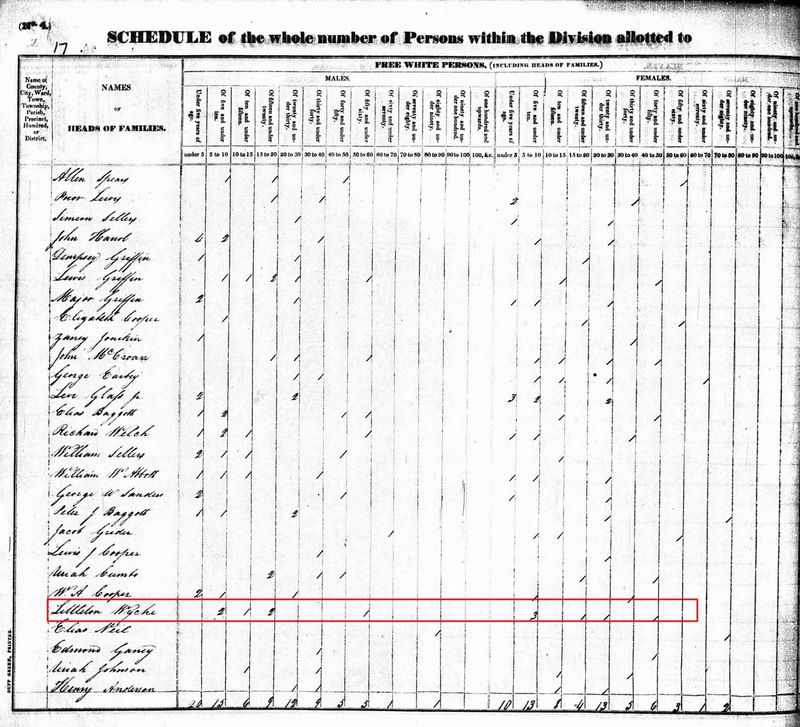 There's a female of the right age (about 60) living with William and his wife in the 1840 Thomas County census. 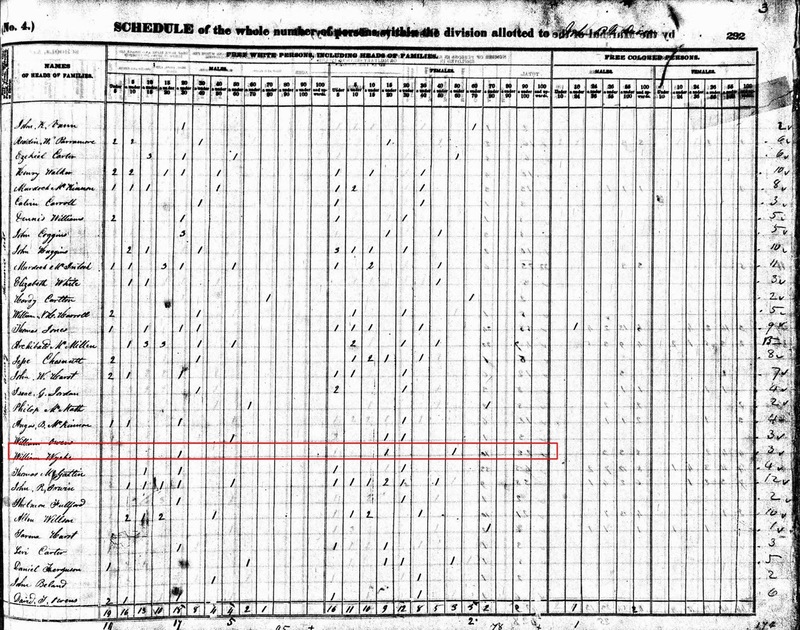 Susannah is enumerated in the 1850 Thomas County census as living with son Thomas and his family. 1850 Thomas County, Georgia, census for Thomas C. Wyche. Susannah is listed as living in his household (click on image for a larger view). Susannah died when she was nearly 70 years old on July 29, 1850. According to her memorial on Findagrave.com, she and Littleton are buried in the Gatlin-Wyche home cemetery four miles east of Thomasville, Georgia. Folks Huxford. Pioneers of Wiregrass Georgia. Vol. 1. Cooper Press, Jacksonville, Florida, 1966, 184-185. 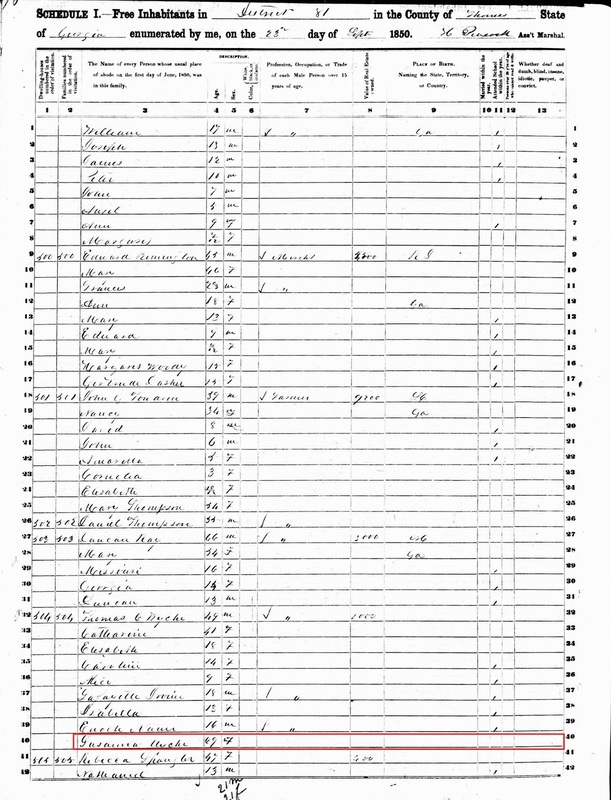 1830 U.S. census, Thomas County, Georgia, population schedule, Not Stated, p. 17, Littleton Wyche, digital image, Ancestry.com (http://www.ancestry.com : accessed 9 February 2014), citing NARA microfilm publication M19; 1840 U.S. census, Thomas County, Georgia, population schedule, Thomasville, p. 292, William Wyche, digital image, Ancestry.com (http://www.ancestry.com : accessed 9 February 2014), citing NARA microfilm publication M704; 1850 census, Thomas County, Georgia, population schedule, District 81, p. 35B, dwelling 504, family 54, Thomas C. Wyche, digital image, Ancestry.com (http://www.ancestry.com : accessed 9 February 2014), citing NARA microfilm publication M432.